It's easy to forget dill if you've given up fish but it's such a lovely, fresh & fragrant herb that lends itself really well to dips so I wanted to celebrate it with this twist on a classic hummus. 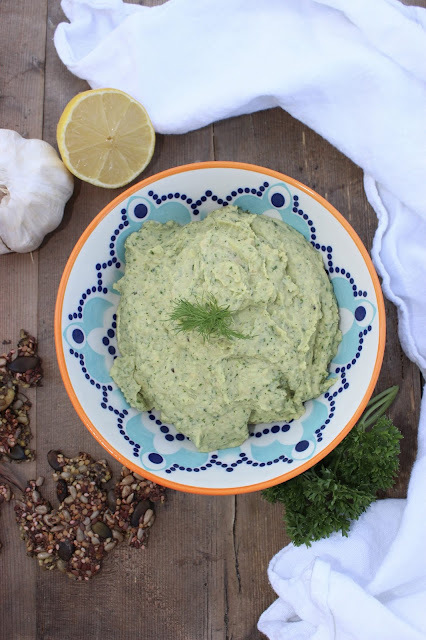 I first served this Herby Lemon Hummus at the Easter NamasTEA event and guests loved it so I hope you'll try the recipe. It's lovely served with crudities but I also really enjoy it with my Beetroot Simple Seeded Crackers (recipe here). 1) In a food processor, whizz together all of the ingredients until smooth and creamy.